Rheumatic fever (RF) is an illness that occurs as a complication of untreated or inadequately treated strep throat infection. Rheumatic fever causes inflammation of tissues and organs and can result in serious damage to the heart valves, joints, central nervous system and skin. Rheumatic fever is rare in the United States, though there were outbreaks in both New York City and in Utah in the 1990s. The disease is more prevalent in the developing world, where rheumatic fever is the leading cause of heart disease. In some countries, as many as one to two percent of children are afflicted with the disease. Though the exact cause of rheumatic fever is unknown, the disease usually follows the contraction of a throat infection caused by a member of the Group A streptococcus (strep) bacteria (called strep throat). The streptococcus A bacteria has also been linked to many serious diseases, including “flesh-eating” disease and toxic shock syndrome. About 9,700 cases of invasive diseases linked to strep A were reported in the United States in 1997. 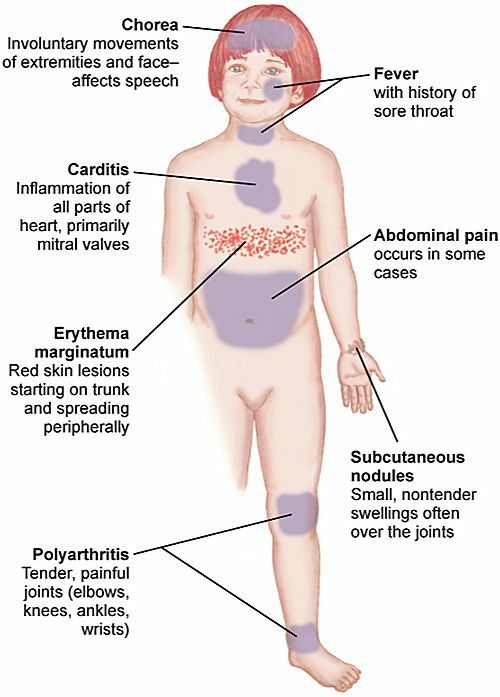 Rheumatic fever may occur in people of any age, but is most common in children between the ages of five and 15. Poverty, overcrowded living conditions, and inadequate access to medical care increase the likelihood of contracting the disease. The initial strep throat is easily treated with a 10-day course of antibiotics taken orally. However, when a throat infection occurs without symptoms, or when a patient neglects to take the prescribed medication for the full 10-day course of treatment, there is up to an estimated 3% chance that he or she will develop rheumatic fever. Other types of strep infections (such as of the skin) do not put the patient at risk for RF. Two different theories exist as to how a bacterial throat infection can result in rheumatic fever. One theory, less supported by research evidence, suggests that the bacteria produce some kind of poisonous chemical (toxin). This toxin is sent into circulation throughout the bloodstream, thus affecting other systems of the body. Research more strongly supports the theory that the disease is caused by an interaction between antibodies produced to fight the group A streptococcus bacteria and the heart tissue. The body produces immune cells (antibodies), that are specifically designed to recognize and destroy invading agents. The antibodies are able to recognize the bacteria because the bacteria contain special markers called antigens on their surface. Due to a resemblance between Group A streptococcus bacteria’s antigens and antigens present on the body’s own cells, the antibodies mistakenly attack the body itself, specifically heart muscle. In 2002, a report announced that scientists had mapped the genome (genetic material) of an A streptococcus bacterium responsible for acute rheumatic fever. The discovery will help researchers map the factors in the strain of bacterium that help it overcome the body’s defenses. It is interesting to note that members of certain families seem to have a greater tendency to develop rheumatic fever than do others. This could be related to the above theory, in that these families may have cell antigens that more closely resemble streptococcal antigens than do members of other families. Symptoms of rheumatic fever usually begin one to six weeks after a sore throat. Symptoms may include fatigue and fever, stomach pain, and vomiting. In about 75% of all cases of RF one of the first symptoms is arthritis. The joints (especially those of the ankles, knees, elbows, and wrists) become red, hot, swollen, shiny, and extremely painful. Unlike many other forms of arthritis, symptoms may not occur symmetrically (affecting a particular joint on both the right and left sides, simultaneously). Rather, pain may move from joint to joint. The arthritis of RF rarely strikes the fingers, toes, or spine. The joints become so tender that even the touch of bedsheets or clothing is terribly painful. A peculiar type of involuntary movement, coupled with emotional instability, occurs in about 10% of all RF patients (the figure used to be about 50%). The patient begins experiencing a change in coordination, often first noted by changes in handwriting. The arms or legs may flail or jerk uncontrollably. The patient seems to develop a low threshold for anger and sadness. This feature of RF is called Sydenham’s chorea or St. Vitus’ dance. A number of skin changes are common in rheumatic fever patients. A rash called erythema marginatum develops (especially in those patients who will develop heart problems from their illness), which takes the form of pink splotches that may eventually spread into each other. The rash does not itch. Bumps the size of peas or larger may occur under the skin. These are called subcutaneous nodules; they are hard to the touch, but not painful. These nodules most commonly occur over the knee and elbow joint, as well as over the spine. The most serious result of RF is called pancarditis (pan means total; carditis refers to inflammation of the heart). Pancarditis is an inflammation that affects all aspects of the heart, including the lining of the heart (endocardium), the sac containing the heart (pericardium), and the heart muscle itself (myocardium). Heart damage caused by RF has the most serious long-term effects. The valves within the heart (structures that allow the blood to flow only in the correct direction, and only at the correct time in the heart’s pumping cycle) are frequently damaged, which may result in blood leaking back in the wrong direction, or being unable to pass a stiff, poorly moving valve. Damage to a valve can result in the heart having to work very hard in order to circulate the blood. The heart may not be able to “work around” the damaged valve, which may result in a consistently inadequate amount of blood entering the circulation. About 40-80% of all RF patients develop a form of carditis. Heart damage, however, may not be apparent until months or years after a bout with rheumatic fever. The effect of the disease on the heart also depends on the avoidance of recurrences. The severity of heart damage is often related to the number of attacks of RF a patient experiences. The initial description of diagnostic criteria for RF were created by William Cheadle in 1889, during a virulent outbreak of the disease in London. In the 1950s, T. Duckett Jones created a list of both major and minor diagnostics for RF. According to the “Jones Criteria,” a patient can be diagnosed with RF if he or she exhibits either two major criteria (conditions), or one major and two minor criteria. In either case, it must also be proven that the individual has had a previous infection with streptococcus. Tests are also performed to provide evidence of recent infection with group A streptococcal bacteria. The doctor may swab the throat and grow a culture to see if the bacteria will grow and multiply. The culture will be processed and examined to identify streptococcal bacteria. Blood tests can be performed to see if the patient is producing antibodies only made in response to a recent strep infection. A doctor may also do an electrocardiogram in order to check for abnormalities in the heartbeat. An echocardiogram, or ultrasound test, may be ordered to check the heart vales, cardiac function and the heart’s structure. Massage: A massage therapist uses gentle strokes to stimulate circulation in and around the joints. Aromatherapy: Often combined with massage, the essential oils of rosemary, benzoin, German chamomile, camphor, juniper, or lavender are used to help relieve pain. Oils of cypress, fennel, lemon, and wintergreen may be used to detoxify or reduce inflammation. Acupuncture: Uses small needles to stimulate appropriate acupoints for pain relief. Osteopathy: Recommends stretching and trigger point therapy to improve mobility, as well as craniofacial massage. Penicillin is still the most effective treatment for rheumatic fever. A 10-day course of penicillin by mouth, or a single injection of penicillin G is the first line of treatment for RF. Patients will need to remain on some regular dose of penicillin to prevent recurrence of RF. This can mean a small daily dose of penicillin by mouth, or an injection every three weeks. Some practitioners keep patients on this regimen for five years, or until they reach 18 years of age (whichever comes first). Other practitioners prefer to continue treating those patients who will be regularly exposed to streptococcal bacteria (teachers, medical workers), as well as those patients with known RF heart disease. Of major concern to medical professionals is compliance in taking oral penicillin. A full course of penicillin must be taken to prevent rheumatic fever. However, it is not always easy for patients to follow such a strict regimen. Researchers have found that the time-honored practice of thrice-daily dosing may be unnecessary. Research has shown that twice-daily dosing is just as effective as more frequent doses, and compliance may be improved, since both doses can be administered at home. Arthritis typically improves quickly when the patient is given a preparation containing aspirin, or some other anti-inflammatory agent (ibuprofen). Mild carditis will also improve with such anti-inflammatory agents; although more severe cases of carditis will require steroid medications. A number of medications are available to treat the involuntary movements of chorea, including diazepam for mild cases, and haloperidol for more severe cases. The long-term prognosis of an RF patient depends primarily on whether he or she develops carditis. This is the only manifestation of RF that can have permanent effects. Those patients with mild or no carditis have an excellent prognosis. Those with more severe carditis have a risk of heart failure, as well as a risk of future heart problems, which may lead to the need for valve replacement surgery. Initial prevention of rheumatic fever depends upon prompt medical attention. Patients should see a physician if they have sore throat that lasts for more than 24 hours and is accompanied by fever. Treatment of a streptococcal throat infection with an appropriate antibiotic will usually prevent the development of rheumatic fever. Prevention of RF recurrence requires continued antibiotic treatment, perhaps for life. Prevention of complications of already existing RF heart disease require that the patient always take a special course of antibiotics when he or she undergoes any kind of procedure (even dental cleanings) that might allow bacteria to gain access to the bloodstream. Because of the prevalence of the Strep A bacteria, it is difficult to completely eradicate rheumatic fever. However, progress in identifying a genetic marker for predisposition to the disease and in mapping the virulence (ability to overcome the body’s defenses) or the bacteria that lead to rheumatic fever may help lead to a vaccine. Researchers are also seeking to develop a rapid test for strep which would mean earlier detection and more prompt treatment of strep. In addition, in 1999, testing began on a vaccine against group A streptococcus. The development of such a vaccine was halted in the 1970s after children who received the experimental vaccine developed rheumatic fever. In 1979, the Food and Drug Administration (FDA) prohibited group A strep vaccines from ever being licensed for use, the only vaccine to carry such a prohibition. Clinical trials have been approved by the FDA, however, it will be several years before a vaccine is approved. Doctors at the National Institute of Allergy and Infectious Diseases remain hopeful that a vaccine will someday be available.